Will China’s stock markets become rational before they become international? The performance of Guotai Junan suggests not. China’s third-largest brokerage joined the Shanghai stock exchange on June 26. Its shares promptly rose the maximum allowed 44 percent, even as the broader market declined. The online portion of the offering, which accounts for 70 percent of the shares, was 148 times oversubscribed. Guotai Junan now boasts a market capitalization of 216 billion yuan ($35 billion), triple its book value after factoring in the new money. Rivals make that seem pedestrian. The average valuation for the 26 Chinese investment banks and brokerages tracked by Eikon is 5.8 times net assets. U.S. rival Goldman Sachs trades at a comparatively boring 1.1 times. There is logic, however twisted. Pumped-up equity markets create a virtuous circle: as shares go up, brokerages mint extra fees from trading and interest from lending to stock-pickers. Valuation metrics based not on earnings but, say, the number of accounts a broker has, are becoming popular. Yet only around one in three accounts trade even in a busy week. Many brokers are also diversifying into asset management, which boosts their appeal. When share prices eventually correct, investors will theoretically use big brokers to divert their money into more stable products. China’s excesses are possible because its markets are still basically sealed. That’s how Shanghai-listed shares of CITIC Securities, the biggest broker by net assets, can trade at more than a 20 percent premium to their equivalents in Hong Kong. But as China’s investors get more opportunities to invest abroad, their exuberance will create ructions. Hong Kong has already had a taste. Mainland investors used the new link with Shanghai to chase companies such as Hanergy Thin Film Power, the shares of which rose to dizzy heights and then crashed 47 percent in a day in May. Undeterred, the city hopes to create another investment conduit with the casino-like exchange in Shenzhen. Foreign market operators courting Chinese capital may get what they want, but it will come with a lot of froth. 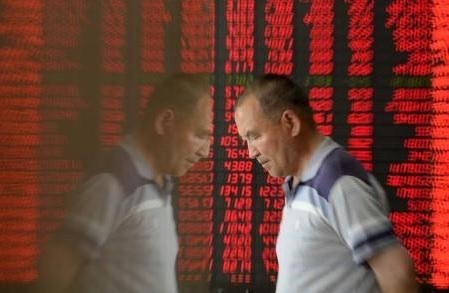 An investor is reflected on the surface of a wall as he walks past an electronic board showing stock information, filled with red figures indicating rising prices, at a brokerage house in Taiyuan, Shanxi province, China, May 27, 2015. Shares in Chinese brokerage Guotai Junan rose by the maximum permitted 44 percent in their opening minutes of trading in Shanghai on June 26. The company had raised 30.1 billion yuan ($4.85 billion) by issuing new shares at a price of 19.71 yuan in an initial public offering, equivalent to 20 percent of the total enlarged share base. After the shares rose to 28.38 yuan, Guotai Junan’s market capitalization was 216 billion yuan. Its offering was the biggest on a Chinese stock market since Agricultural Bank of China listed in 2010. The brokerage was the third biggest in China by net assets as of the end of 2014, according to data in its prospectus. CITIC Securities and Haitong Securities, the first and second largest, had market capitalizations at the close of trading on June 25 of 337 billion yuan and 252 billion yuan respectively. The online part of Guotai Junan’s offering, which made up 70 percent of the allocated shares, was 148 times oversubscribed.